This holiday period I am reading David Finkel’s new book, Thank You For Your Service, published by Sarah Crichton Books. It’s a compelling read. On every page we are reminded of the reality of American wars since Vietnam, of the persistent toll that traumatic brain injury, post-traumatic stress, depression, and anxiety have on veterans and their families. At times, the stories will break your heart, and they piss me off enough to want to channel my energy to help. As a growing evidence base of yoga studies demonstrates, such stress, depression, and anxiety is ultimately processed through the physical body. For those who want to try to take a break from their stress and anxiety, we at the Give Back Yoga Foundation have a toolkit that can help connect the mind and body, which has been especially designed and tested for veterans. It includes breathing practices (pranayama), meditation, physical postures and movements (asana), and a specific form of guided rest (Yoga Nidra). It’s called Mindful Yoga Therapy for Veterans. It may not be the only thing veterans AND their spouses need in the healing processes, but with other tools, we have seen real change happening. We are reaping the results of sending this toolkit to nearly 10,000 veterans and 43 VA hospital facilities and hearing back on the unbelieveable benefits veterans experience—freedom from traumatic stress! If you’re a veteran or service member, I encourage you to request a free copy of this toolkit. My hope is that these resources will help you to find the same relief and peace that other vets have experienced when they discover these practices. And if you’d like to tell a vet “thank you for your service,” please consider making a donation to our Yoga for Veterans program. A contribution of $50 will help us to bring yoga toolkits to 10 veterans. You can also make a lasting impact by joining our monthly donation program – with a contribution of just $15 to Yoga for Veterans, you’ll help us to bring healing yoga practices to three veterans every month. It’s one the best ways I can think of to say thanks – and I’m grateful to each and every one of you who is contributing to this movement of hope and healing. Do you want to bring the healing practices of yoga and meditation to veterans? Mindful Yoga Therapy for Veterans is an empirically informed, clinically tested program comprised of five practices – pranayama, asana, yoga nidra, meditation and gratitude – that give veterans a “toolbox” that can carry them into a life of strength and resilience. Find a Mindful Yoga Therapy training near you, or join Give Back Yoga at the Sedona Yoga Festival in February for a two-day Mindful Therapeutic Yoga Practices for Veterans pre-conference training. Executive Director Rob Schware talks with Yoga for the Larger Woman founder Vilma Zaleskaite for The Huffington Post Blog to learn how yoga is transforming the way that plus-sized women are living in their bodies. Click here to learn more about Vilma’s groundbreaking projects with Yoga for the Larger Woman, including the yearlong “Living in My Body” (LiMB) study and a 2013 calendar featuring stunning images of Vilma’s students at practice by award-winning photographer Joni Kabana. Help Give Back Yoga Foundation to meet our goal of sharing yoga toolkits with 10,000 veterans in 2013. Through December 31st, when you donate $30 to our crowd funding campaign, you’ll receive download links for two guided meditation practices as a gift of thanks. Evidence continues to grow for the power of mind-body practices to help trauma survivors heal from the effects of traumatic stress. The latest promising news comes from a research brief on the effectiveness of the Trauma Informed Mind Body (TIMBo) program, developed by YogaHOPE founder Sue Jones. ~Master simple coping strategies that they can use anywhere, anytime. ~Gain awareness of their bodies, so they can defuse the endless feedback loop of emotional traumatic memory. ~Gain awareness of their inner experience, so they can begin to reconstruct their belief in themselves. After assessing the impacts of the TIMBo program, mental health professionals found that women who had completed the course showed a significant decrease in symptoms of depression, anxiety and trauma. Even more powerfully, they had begun to change their inner dialogue and talk to themselves in a more self-compassionate way. “I have re-found my faith in myself, and my confidence,” wrote one woman, about the impact of the TIMBo program. Kudos to YogaHOPE for reinforcing the mounting evidence that mindfulness can aid in trauma recovery – and for changing the world by empowering women and stopping the cycle of violence in families and communities. Executive Director Rob Schware talks with author Lilly Bechtel for The Huffington Post Blog to learn how yoga is saving the lives of veterans, and how she’s striving to open up dialogue between military and yoga communities. To read Lilly’s full Huffington Post interview, including the story of how she discovered yoga and how she’s seeing the practice change the lives of veterans, click here. And don’t miss Lilly’s Elephant Journal series At Attention, At Peace, featuring conversations with veterans, teachers and military officials on how yoga can help returning soldiers to heal from post-traumatic stress. 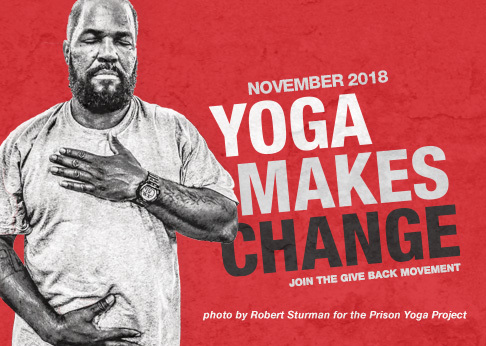 Help Give Back Yoga put free yoga and mindfulness guides in the hands of 10,000 veterans this year by making a one-time or recurring donation in the amount of your choice. Gifts of any size are welcome – every dollar counts!